A veteran and a first-timer share “Athlete of the Week” accolades following a review of Bristol and Terryville fall high school sports. They are senior quarterback Justin Marshall of the Bristol Eastern football team and junior volleyball setter Alexis Carabetta of St. Paul, respectively. Carabetta, the daughter of Beth and Mark Carabetta of Meriden, is one of the key players who will return next year for varsity head coach Devin Pecevich. She was selected a second team All-State pick in Class S this past season after posting 272 assists, 13 kills, 49 aces and 113 service points. The Falcons went 7-13 in 2017 and turned things around this fall with a win-loss mark of 17-5, earning a trip to the second round of Class S tournament play. St. Paul, seeded No. 5, topped visiting No. 28 University 3-0 in the first round before losing to visiting No. 21 Immaculate in the next round. She added that she and her teammates aren’t losing many players, so there will be a lot of potential for further success next fall, and they have coach Pecevich returning for a second run. Carabetta took up the sport in middle school in the sixth grade. In addition to volleyball, Carabetta also plays tennis for St. Paul, concentrating on doubles play. Marshall, who has also received multiple “AOW” nods in wrestling, won Bristol Eastern's 2018 offensive player of the game honors for his play in the annual Thanksgiving Day game played the day after the holiday. In the 24-19 Central win, Marshall took part in each of the Lancers’ three touchdowns. He rushed for 92 yards on 19 carries and completed 6-of-8 passes for 115 yards. Two tallies were on short runs, with his passing score going to Jaden Larise for a 61-yarder. For the entire season, Marshall made 97 of 169 passes and threw for five touchdowns and 977 yards. His career passing yardage of 3,268 sits third all-time in Bristol high school football, and second to Steve Mills at Bristol Eastern. His coach, Anthony Julius, praised his offensive field leader. “Justin has been a three-year starter for us at Bristol Eastern at quarterback. He also played two years of defense as well,” Julius said. “He is an all-around football player. Justin is defined by his toughness. Every week when I speak with other coaches, one of the first things they say is No. 11 is one tough kid. To me that is the ultimate compliment, when an opposing coach views you as a tough player. Marshall talked about his final high school football game. In getting to where he is today, Marshall took up organized football in kindergarten with the Bristol Bulldogs and stayed in the program until high school. He played either running or quarterback through the years and says quarterback is his favorite position on the team. “You are the leader of the team. You make important decisions on the field,” Marshall said. He is now practicing for the 2018-2019 wrestling season and is competing once again at 152 pounds. Last year he captured the Class L crown at that weight and finished sixth at the State Open. His plans for the 2019-2020 school year include studying criminology in college, while also playing football at that level. 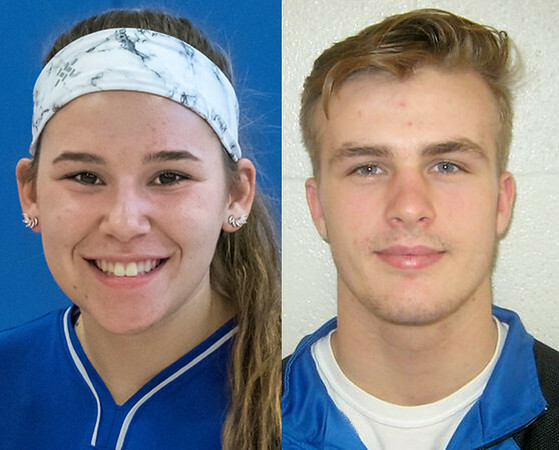 Posted in The Bristol Press, Athletes of the Week, Bristol Eastern, St. Paul on Monday, 3 December 2018 18:48. Updated: Tuesday, 4 December 2018 11:57.